This past year I’ve been spending an increasing amount of time flying very short lines, 30′ or less. I’ve always enjoyed watching videos of this style of flying; Gregory Reynes on his Lynx Feather; or Chris Goff on his Element; I’d just never gotten around to trying it out for myself. Then last year I was vacationing at a beach which was really too narrow to fly at high water and I was frustrated at all that smooth wind going to waste. So one evening I repurposed a well used lineset, cutting it down to make 30 and 20 foot lengths and the next day my short lines learning curve began. I stuck with my trusty Deep Space UL for these initial sessions, a kite which I know inside out and I figured it’s light/floaty characteristics would buy me more time and save on scampering around quite to much to keep the kite off the ground. Over the following months I’ve had good results with several other smaller designs and I figure I know enough about it now to write my experience and recommend y’all at least give it a go. Besides the ability to fly in tight spaces there are three other positives to flying this way, all of which will improve your flying technique and on any line length. The first is that being so close to the kite you develop a better understanding of the effects of all your inputs, you can easily see the lines and how the kite reacts to mistimed inputs and the absence or excess of slack. The second is that by necessity you’ll improve your hand speed; small kites need correspondingly smaller and faster inputs and I’ve definitely seen the benefits in my all round flying. 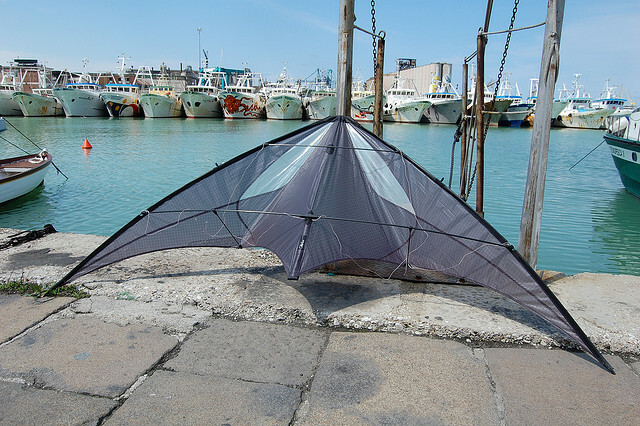 Finally, you’ll quickly realize that you’re able to fly in the very lightest of winds, really pushing the lower limits of the kite, which makes this style a great option in lulls or low wind festival days. Chances are that you don’t already have a suitable lineset, so you’re going to need to make one. If you’re a savvy kite flier you’ll have a bulk spool of line for just this eventuality but if you’re not, like me, you’ll have to order a lineset or chop an old one down. I suggest you do the latter, as there is no guarantee you’ll enjoy this short line gig, so you’re better off investing in a new set at your favourite length. Chopping down a old set will give you two short linesets, each (probably) sleeved at one end. You needn’t sleeve the other end, just tie a loop and larkshead to leader lines and you’re all set. You don’t even need finger straps on the lines (much less wrist straps) you be able to fly just fine holding those sleeved loops. The great thing about these lines is that it allows for flying in places you’ve discounted or never event considered before. Shallow beaches; small patches of grass; the banks of rivers or lakes; small city parks; the tops of multi-story parking lots your choice is limited only by your imagination. As for for the choice of kite, I suggest some floaty ultralight design 7ft or smaller. Why a UL you ask ? Well if you have Goff/Reynes Godlike speed and skill then of course you can use whatever you want; but for us mere mortals a STD will be likely be too heavy and require too much scampering about in light winds and would be zipping about the tiny window too quickly for your reflexes if you tried flying in stronger winds. What about a SUL ? Sure a SUL would work too, however they tend to be less tricky than UL’s, have a more limited wind range and are more fragile. Flying in this small window will inevitably result in a few unplanned landings, at first at least. While you’d just dust off a UL and smile about it, you’d likely be packing up your wounded SUL and cursing me for even suggesting this short line malarkey. A full sized (>7ft) kite is ruled out because of the small window. Of course you can fly one but you’ll find your tricks/combos limited by the available window. The turning radius of 8ft kites would likely present a problem too on, you’d be catching wingtips on the ground too often. In the follow sections I’ll divide the kite options by size, 7ft, 6ft and 5ft+, describe the kite used in each size and suggest a couple of good alternatives. All of these kites are capable of most any trick or combo you can think of. Each kite is nice and floaty making it good for flatspins tricks, including the must have Taz Machine. They all rollup and perform wrapped tricks, all comete and a couple of them will even Cynique. 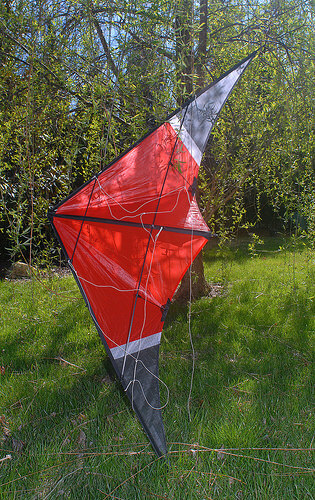 My choice of 7ft kite as I’ve said is the Benson Deep Space UL. This kite is so good and for so many reasons it’d be my desert island kite, should I ever find myself so marooned. The DSUL is particularly suitable because of its floaty good manners. It’ll do most every trick you throw it at (except Cyniques) and when you stuff up you’ll likely be able to untangle it before it reaches the ground. The rollbars make for can’t miss wrapped tricks and its framing is plenty stout enough for some rough and tumble. Finally, Benson’s are the very best made kites, period. Mine, the very first UL prototype, looks as good as new today, 10 years and countless beach sessions later. I’ll put in a good word for the Benson SuperFly UL, which I’ve had very good results with on 30′ lines. The SFUL offers all the tricks of the DSUL but with improved turtle based moves and will cynique (for fun). It’s probably every bit as good as the DSUL, better even, but we all have our favorites don’t we ? I’ve flown the SkySportDesign Transformer SUL a bunch recently, and it makes a fine alternative to the DSUL. More UL than a true SUL the kite is strong enough to handle a variety of conditions. It’s particularly good at wrapped tricks and floaty enough to pop double Slot Machines. There are several R-Sky kites which would work. Both the Krystal FX (KFX) LW and WW versions are very fine kites, the WW is somewhat trick limited compared to the other kites so I’d plump for the LW version. I have no experience with the Fifteen or the Shooter but I’d imagine their LW version would fit the bill quite nicely, as would an NFX with a little reframing/weight reduction. There is a short learning curve whilst you get used to the feel of the kite, it needs softer and quicker inputs than the DSUL else you’ll overpower it. The Feather is not a kite to be slapped around but rather finessed into positions and combos. Treat it gently though and you’ll be able to fly in the very faintest of winds and in those marginal conditions I like to practice my take off and landings, slots to tip stand, reverse coin toss and the like. The build quality is very good, although I have my doubts regarding the long term durability of the yo-yo stoppers and I don’t suppose the nose will fare as well as the DSUL. It’s been a bit of a gateway kite for me, and I’ve learned several new fractured combos since I started flying with it. I think this’ll be the kite I try flying on even shorter lines, as Gregory does in some of the Paris sequences above, that might pose some new challenges but I look forward to them and more time on this addictive little kite. I only wish I’d bought one years ago. I’ve been enjoying the Atelier “Double Zero” of late which is a SUL/indoor kite. Whilst not as versatile or robust as the Feather and a little more fussy about the inputs it’s definitely a great option and has the edge in low wind capability. Just be gentle with it. I’m reliably informed that the R-Sky Frenezy EVO when reframed with SkyShark 2PT spars all round becomes a SUL deluxe. I’ve not gotten around to reframing mine yet but I have no reason to doubt that it’d make a compelling short line kite. The Buteo is a street kite by German designer Peter Maternus. The leading edges are straight, the graphic is simple but effective for a modern look. It really is a small kite, even compared with the 6ft designs described above but don’t let it’s diminutive size deceive you, this is a very capable freestyle kite, there isn’t much that the Buteo doesn’t have it’s locker. The size is definitely an advantage in one respect, it gives you more window to work with. So where you might find cometes cramped on the DSUL or Feather can can bash them out here. The build quality of the kite is impressive with several thoughtful design touches. My only niggle is the tail weight arrangement. It’s perfectly functional, just a little at odds with the otherwise neat and tidy design. Back to that quirk, there is a significant amount of window consumed when transitioning from fade to pancake positions (1:16 in the video below). How much of an issue this is for you depends on the length of lines you choose to use and how often you fly tricks requiring this transition. For me its not a big deal at all, but it does look odd, as the Buteo swoops down to pancake. But forget my nit-picking and watch those videos again, this is a tremendous kite and you don’t need to have PAW’s skills to enjoy it and get great results from it. Unfortunately there aren’t so many options in this size category and your choice is therefore very limited. If you can find an R-Sky Jordana that would work very well, I wish I’d never sold mine. Kitehouse made limited runs of the “Sissy” kite, which was very well received though you need to add yo-yo stoppers and tail weight to be able to wrapped tricks. David Ruger has a new design available for builders – the “Day & Night” which is even smaller than the Buteo/Jordana and I’m sure given his design style (the Magnet) will be very tricky. I hope I have persuaded a few of you into trying out this short line thing. I strongly believe it to be a practical and long term beneficial style of flying. I’m sure there are other worthy kites which I’ve neglected to mention and which be excellent choices, alas I’ve not flown those. Rest assured though, you can’t miss with those I’ve focused on, the versatile DSUL, the elegant Lynx Feather or the freestyle monster which is the Buteo.